Lidstrom spent his entire twenty-season NHL career with the Red Wings. In that time he won seven Norris Trophies as the league’s best defenseman, second only to Bobby Orr’s eight career wins. He was a part of four Stanley Cup Championship teams and became the first European captain of a Cup winner in 2008. He was given the “C” by the Red Wings’ in 2006, following the retirement of longtime captain Steve Yzerman. Lidstrom ends his career with 1564 games played, with the 12 games he missed due to injury last season the most of any single year. He has 264 goals and 878 assists for 1142 total points, to go along with a career plus/minus of +450. In addition to twenty seasons with the Red Wings, Lidstrom played for his native Sweden at the Olympics four times, winning a gold medal in 2006. He played in the NHL All-Star Game eleven times and was named to one more team in 2009 but did not play. The Red Wings made the playoffs every year of Lidstrom’s career. “It’s hard to put into words exactly what Nicklas Lidstrom has meant to the Detroit Red Wings over the last 20 years,” Detroit general manager Ken Holland said. With the news about Nicklas Lidstrom just having broken, this is hardly important, but I wanted to post something before I forgot. For the Red Wings, the results are similar. The top three are Smith (12), Brown (8) and Johnson (5). Wilson is one of eight names tied for fourth with four. Defenseman Brendan Smith is the only player currently on the roster with one of those names. Having never played a game in Detroit, Grand Rapids Griffin Jamie Johnson is not counted in the list. The Detroit Red Wings have called a press conference for 11:00 AM on Thursday at Joe Louis Arena. Detroit general manager Ken Holland and team captain Nicklas Lidstrom are scheduled to speak. It’s expected that Lidstrom will announce his retirement, ending a twenty-season NHL career. The Red Wings have not typically called press conferences to announce the re-signing of free agents. The official Twitter account for the Red Wings’ Traverse City-based training camps has confirmed that their deleted tweet from earlier today, which stated that Detroit captain Nicklas Lidstrom would be retiring, was based on a joke on the Red Wings’ own Facebook page. Could Nicklas Lidstrom‘s NHL career be over? The tweet was deleted within minutes of having been posted and those running the account did not reply when asked about it. It’s possible that the information behind the tweet is incorrect, leading to its deletion. It could also be that it’s true but wasn’t intended to be announced at this time. Lidstrom is at Joe Louis Arena today, as noted by the team’s official account. Update – 12:56 PM: It’s possible that the original tweet was in response to a comment posted to the Red Wings’ official Facebook page. Since deleted, the note said (paraphrasing) “Lidstrom is retiring… to his computer to vote for Pavel Datsyuk on the over of NHL 13.” Still no response from the account owners, though. Thanks to @TheNorm41 for pointing that out (and a handful of others, he was the first I saw). Update – 2:40 PM: Per George Malik, the Red Wings have confirmed that the tweet was inaccurate. I’ve heard nothing myself but it makes sense. As I said on Twitter, this is why deleting tweets is bad form. You can’t take back something once it’s been said, you can only correct yourself. Update – 2:44 PM: And now @RedWingsCamps has confirmed as well. Sports Business Journal reported today that the Detroit Red Wings are moving forward with their plans to build a replacement for Joe Louis Arena, having hired architects HKS and Chan Krieger NBBJ for the project. It should be noted that the successor to the Joe is clearly not even a concept at this point. No location has been determined (it was originally thought that owner Mike Ilitch planned to build an arena behind Fox Theater, but of late it seems there may be a preference for land near Temple St. and Woodward Ave.) and the only reported specs for the arena are that it would seat approximately 18,000, down from the 20,066 that the Joe seats. I’ll say that I like the combination of HKS and NBBJ. Both SBJ and the Detroit News point out that HKS was behind the design of Dallas’ American Airlines Center, home of the Stars and the NBA’s Mavericks. The AAC has always reminded me of a modern Olympia, with it’s brick facade and arched windows.NBBJ is noted for their work on the Detroit riverfront project but I’m more interested in the fact that they did Columbus’ Nationwide Arena, which I’ve said before is what I hope the next arena in Detroit will be like. There’s still a lot that needs to happen for a new Wings’ arena to come together but I’m very intrigued by this hire. 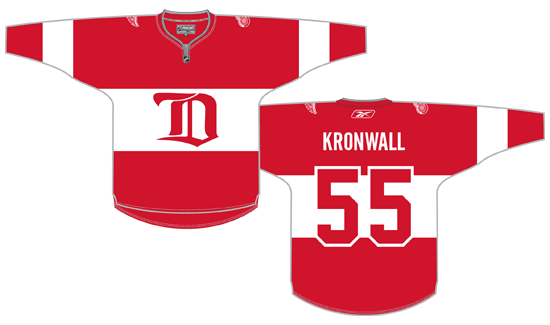 Back in February I took a look at one possible jersey the Red Wings could wear next January when they host the Toronto Maple Leafs in the 2013 Winter Classic at Ann Arbor’s Michigan Stadium. Now I’ll go through another option for the team. As I said last time, you can be pretty sure that we’ll see some form of “vintage” look from both Detroit and Toronto. I think that it’ll be something based on a look the teams have previously worn, rather than an entirely new design. As such, this one is a familiar look, based on the sweaters of the 1926-27 Detroit Cougars. This is a familiar look, as it’s the style the Red Wings wore in 2009 when they visited the Chicago Blackhawks for the Winter Classic at Wrigley Field. It allows the team to have some consistency in that respect. Detroit will be the home team next January, and in all likelihood will be wearing dark jerseys. As the 2009 sweaters (like the ’26-’27 ones they were based on) were white, I switched the colors around to make a dark version. The color swap is the only change I made to keep things consistent with the 2009 design. As with my last concept, I’d expect a lace-up collar to be part of this one. My template just doesn’t show it. I avoided following the trend of using “vintage white” because the 2009 version of this sweater didn’t and I wanted consistency between the two. The big benefit to going with this one would be branding. The Red Wings already have merchandise featuring the Old English D (even if it’s what I would say is the wrong D) and the ’26-’27 Cougars sweater is the only time they’ve ever regularly worn it. If they wanted to wear something other than the Winged Wheel, it seems like the Old English D is what they’d default to. I have no advance knowledge of what the Red Wings or the Maple Leafs will wear on New Year’s Day, this is just a concept of something Detroit could wear.I know my template isn’t perfect. I’m admittedly too lazy to fix it. I already mentioned that I expect the sweater to have a lace-up collar and I know the Reebok vector would be replaced by their wordmark.